I have not dwelt much on the pre-Roman history of Antioch mainly because there is so little physical evidence excepting the political history of the fractious Seleucid Dynasty. One tidbit appeared to us this week about Alexander II Zabinas (Greek Ἀλέξανδρoς Zαβίνας), ruler of the Greek Seleucid kingdom, was a counter-king who emerged in the chaos following the Seleucidian loss of Mesopotamia to the Parthians. The part of his story which interests me most is that when he fled to Antioch in 123 BC, he reputedly plundered several temples, including that of Zeus, reputedly to pay his troops. He is said to have joked about melting down a statuette of the goddess of victory Nike which was held in the hand of a Zeus statue, saying "Zeus has given me Victory". 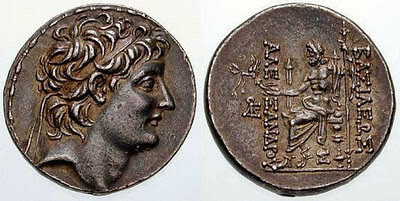 He is pictured on the obverse of this coin holding the statuette of Nike in his hand. Enraged by his impiety the Antiochenes cast Zabinas out of the city. He soon fell into the hands of robbers, who delivered him up to Antiochus, by whom he was put to death, in 122 BC. hi are you living in Antioch ? Why are you so interested in Antioch?